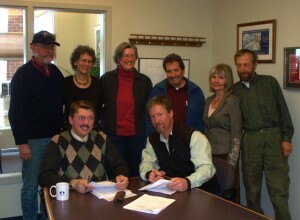 After many months of collaboration with the Town of Pagosa Springs, the Geothermal Greenhouse Project team is pleased to announce the signing of the Project’s Land Lease and Geothermal Tap Use Agreements. The signing of these agreements clears the way for the next phase of the Project, which was supported by resolution of the Town Council last year. Since the passage of that resolution, important steps have been taken to ensure fulfillment of the Project’s mission and the interests of the community as a whole. Special thanks to Pagosa’s Growing Spaces! At a Town Council meeting in October of 2009, members of the Geothermal Greenhouse Project Committee outlined an operational model designed to increase broad-based community participation in the Project. In that model, one large greenhouse will be devoted to education. Private and public school educators Mark DeVoti, Sally High and Guseppi Margiotta have expressed interest in developing an Agricultural Curriculum for students in grades K-12. Liz Parker, Prevention Education Coordinator for the Archuleta County Victim Assistance Program, is excited about the therapeutic value of programs for at-risk youth. Bill Nobles sees applications for participants in educational programs sponsored by the Archuleta County Extension Office and the Dean of Agricultural Science at the University of Colorado in Ft. Collins has suggested that graduate students travel to Pagosa Springs to study the application of renewable energy in the project. The second large greenhouse will be for testing commercial production of vegetables, increasing the availability of year-round fresh produce to citizens, local businesses, schools and visitors. It will serve as a prototype business model, which could be expanded to other venues, and provide internship opportunities to high school students preparing for a career in agriculture. The Committee envisions the third large Dome as a Community Garden. It, as well as many of the outdoor beds surrounding the geo-thermally heated structures, will involve the largest number of local, small growers possible. Additional proposed facilities include a visitor’s center, public rest rooms, a cold-storage facility and a permanent site for the Farmers Market. Gardeners currently cultivating plots in Centennial Park, members of the High Mountain Gardeners Club, the Farmers Market Committee and Southwest Organization for Sustainability have all offered valuable suggestions and enthusiastic support. As currently envisioned, the management of Geothermal Greenhouse production will rest with those using the Domes. Those using each greenhouse will organize what they believe to be the best use of space, through consensus and/or democratic governance. A non-profit Board will oversee the entire Project and will include representatives working in each area of the Project: education, commercial production and community garden. Over the next few weeks, meetings will be held to discuss and refine this model of operation for possible incorporation into the Project’s Operations and Business Plans. Anyone interested in participating is invited to contact committee member Ilene Haykus at 731-0553.